Keeping up with what’s Trending in art licensing involves a lot of observation, walking trade shows, research and following social media feeds. Sometimes it’s difficult to identify an emerging trend, but quite easy to see a trend that’s in it’s peak, like — Mythical Creatures. Are Unicorns taking over the World? Yes! Yes, it would appear that Unicorns have taken over just about every surface, design and concept it can be applied to. From unicorn fabric, wall art, stationary and gifts to Unicorn food, fashion, hairstyles, beauty products and liquor. Even Starbucks came out with a Unicorn Frappuccino this past April! Starting back in 2013-14, the Unicorn trend is probably at it’s peak and won’t subside for another year or two. 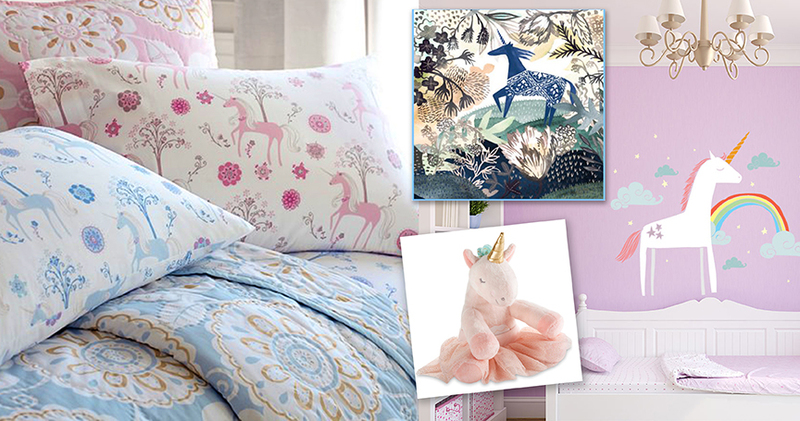 Now that we’ve highlighted the Unicorns… we guarantee that you will start seeing them everywhere! Other Mythical creatures like mermaids and dragons are still strong in the market. We highlighted the Mermaid trend in our last article here. And fantasy dragons are still continuously popular in art licensing. 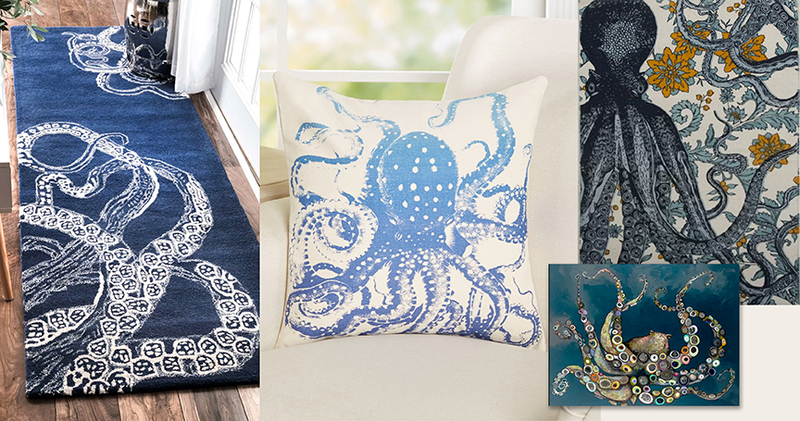 Though we also mentioned the Coastal trend back in February, JJ Galloway, who runs the Trends group on the Art Licensing Show, pointed out in a recent group post about the Octopus showing up. Modern Farmhouse trend… going strong! Another trend that seems to be going quite strongly in the market is Farmhouse Style Decor. This trend has been around for awhile but got a serious boost from the popular HGTV Show — Fixer Upper with Chip and Joanna Gaines. 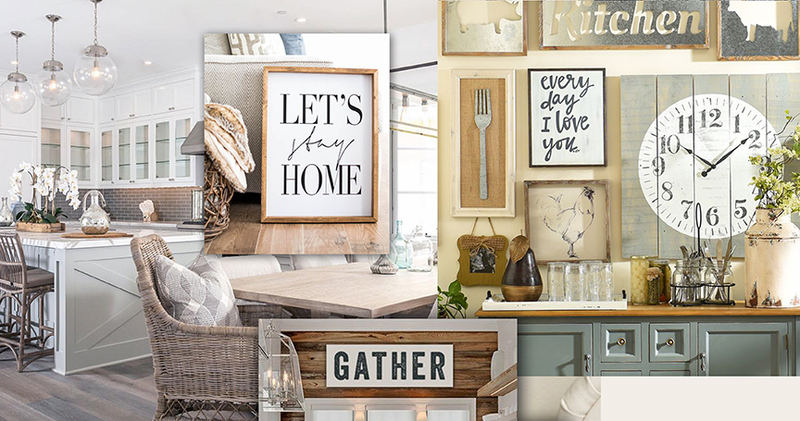 Sometimes referred to as Modern Farmhouse or Eclectic Farmhouse, it is has a definitive look and covers many markets like wall art / hand lettering, textiles, gifts, and home decor. We posted about it in the last trends blog post here. It can also take on a bit of a neutral spin as well. Joanna Gaines markets her own Farmhouse Style Decor under the brand name Magnolia Market. Other trend research to keep your eye on are… Llamas, Day Planners are everywhere!, Christmas Vintage Red Trucks, Southwest Desert plants, Black-White and Gold, Hand Lettered—Words and Sayings, and Millennial Pink (which is a salmon pink color). 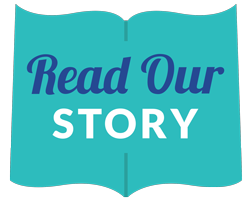 With the Atlanta Gift Mart last week and Surtex, Blueprint and the Licensing Expo shows this past May, there is a lot in the market to take notice of. There will always be the Traditionalists in art licensing but it’s still kind of fun to see… what’s going to “happen next”! Thanks very much JJ Galloway for the information posted in the ALSC trends group! All images used for this trend report are for editorial and educational purposes only. This entry was posted in Art Licensing Show + Tell, The Trend Table on July 20, 2017 by Art Licensing Show . ← Winter / Christmas Flag Art Challenge with Studio M ~ Top 6 Winners! Great article, on trends . . . thank YOU for sharing with ALL of us!! !